by Haley Goetz Marie Antoinette, like the idyllic swath of rural France that it is set in, hits the eye like an exquisite Monet painting. Whether it is through its contrasted colors, its natural hues, or its evocations of a more-than-extravagant lifestyle, the film blends old and new artistic elements together to create a product that is dazzlingly original and historically rich. Kirsten Dunst, in the be-wigged titular role of the Queen of France, is both charming and moody, provocative and outspoken, elegant and reserved. While Marie Antoinette doesn’t pack the punch of, say, The Virgin Suicides or the existential wonderment of Lost in Translation, it still remains an important and well-regarded entry in Sofia Coppola’s filmic legacy. The film begins by introducing the young Madame Antoine (Dunst), who is just 15 years of age when she moves from Austria to France to wed Louis XVI (Jason Schwartzman). The audience follows Antoine as she come to terms with her newly lavish lifestyle and her dull husband. Months pass before the couple consummates their marriage. When they finally do, they’re able to produce four children (one of whom dies at a very young age due to health complications). With her new name and new freedoms, Marie Antoinette also delves into a passionate affair with a Count named Axel Fersen (Jamie Dornan). However, all that is good about Antoinette’s life at Versailles comes to an abrupt end. She, her husband, and her children are taken off to Paris by an angry mob while Versailles is left empty at the film’s conclusion. 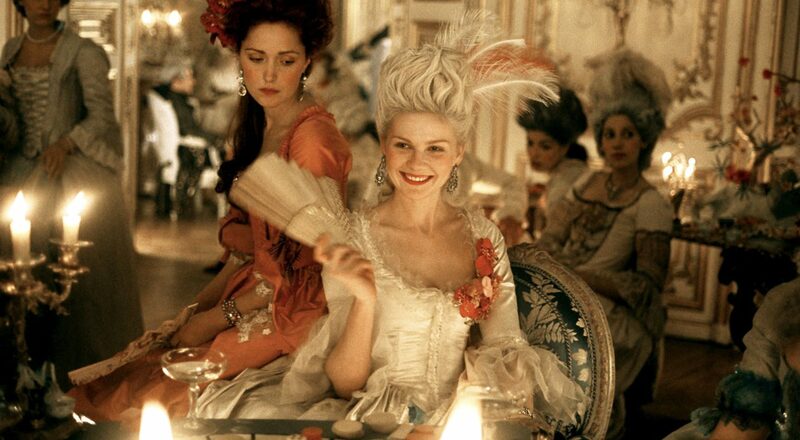 The best part about Marie Antoinette is its visuals. Lensed by Lance Acord (Coppola’s frequent collaborator), the film is shot with a sense of patience that allows the audience to soak up both the characters and the settings. One particular element worth mentioning is Acord’s use of resplendent colors. While his colors certainly accentuate the luxurious sets, they also add an important element to the overall story. If the display of colors was more muted, the audience wouldn’t see the grandeur of living at Versailles. In particular, the coronation scene of Marie Antoinette and Louis XVI is not to be missed, with its striking gold inlays on the wall and silky blue robes. Another interesting aspect of the film is its wildly inventive score. Even though the story is situated in the classical music-heavy 18th century, the music featured in the film is anything but orchestral. Featuring songs by such prominent modern acts like The Strokes and The Cure, Coppola uses this idiosyncratic device to her advantage. While this has become a bit of a cliché in other modern historical dramas (*cough* Baz Luhrmann’s The Great Gatsby *cough*), in Marie Antoinette this tactic surprisingly works wonders. As a first-time viewer of the film, it’s really neat to see Coppola’s postmodern vision of the landscape of this time period. This tool is integrated better in some moments than in others. For example, there’s one effective scene where the young Prince Louis talks to his friends in the woods about his upcoming marriage while “The Melody Of A Fallen Tree” by Windsor for the Derby plays in the background. A myriad of people have pointed out how Kirsten Dunst is the de-facto muse of Sofia Coppola, mainly regarding her earlier films (The Virgin Suicides being the most prominent example). They complement each other quite well in this particular instance. Dunst can be passive yet highly emotional at the same time. She goes from walking with great composure down a palatial hallway to collapsing against the door to her bedroom in tears. As I see it, Sofia Coppola is one of the most humanistic directors to ever make moving images. While it requires a trained eye to see the emotional layers that are present in her films, they are probably the most sophisticated and well-developed aspect of Coppola’s modest but exceptional filmography. Like a muted watercolor painting, Coppola’s films are quietly expressive. This doesn’t mean that the necessary emotions aren’t there, it just means that they are buried deep beneath the film’s surface. Marie Antoinette remains a wonderful addition to the Coppola family’s cinematic legacy. Sofia Coppola provides her audience with an intimate peek into the life of one of history’s most controversial figures. She treats the subject with the fairness that she deserves, while also placing Antoinette at enough of a distance for the audience to see the wrongs that the Queen was committing against her people. While this film doesn’t quite stack up against such Coppola classics as Lost in Translation, it is still a stunning work of cinematic art.